The Dragon Ball Super Soft Gliders are perfect for fun around the house! Create your very own glider plane, complete with livery displaying some of your favourite Dragon Ball Super characters! The Dragon Ball Super Soft Gliders are perfect for fun around the house! 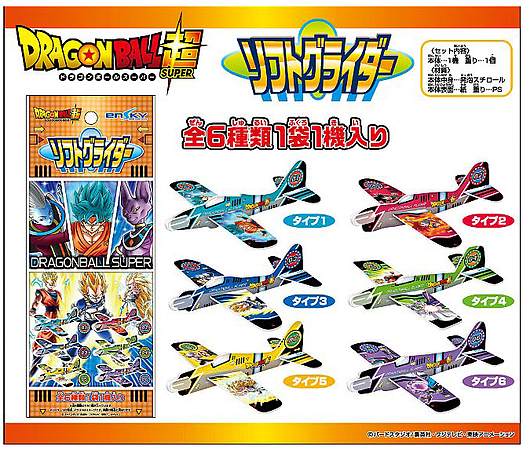 Create your very own glider plane, complete with livery displaying some of your favourite Dragon Ball Super characters! With 6 to collect, from SSGSS Goku and Vegeta, Goku, Vegeta, Whis and Beerus, Piccolo and Gotenks these are sure to provide plenty of fun!